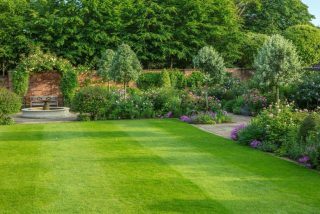 For many years, we spent substantial amounts of money on lawn care companies who used to come up with a long list of treatments each year which were, so they assured us, essential to keep our lawns healthy. 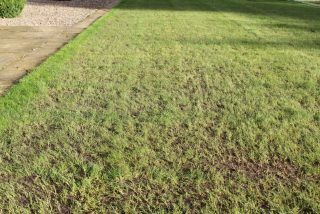 Deferring to the expert’s advice, we agreed to everything suggested and were then devasted to look at lawns heavily infested with meadow grass and suffering from various fungal infections. Upon advice, we bought expensive cylinder mowers and verticutters which were cumbersome to handle and therefore never used. 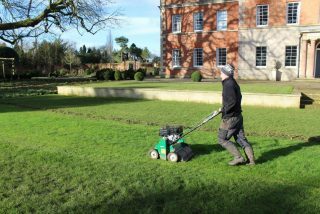 Having all but resigned ourselves to returf the whole lot, the garden team voted for getting rid of all external advice and implementing a very simple routine instead: In March and autumn, all formal lawns are thoroughly scarified, followed by a moss treatment with lawn sand and a spring or autumn feed. The moss treatment is usually only done in the spring. Depending on how ‘hungry’ the grass looks, it can be fed two to three more times during the summer. 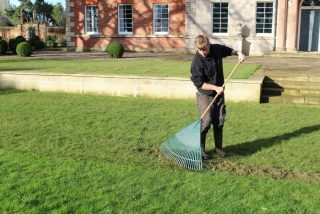 Scarifying, done in both directions, removes the thatch, is a layer of organic matter which accumulates around the base of the grass plants. It consists of of living and dead plant matter including crowns, stolons, rhizomes, and roots. If there is too much thatch, the roots of the grass plants suffer. It is always surprising how much thatch has accumulated since the last treatment. The thatch is raked up and taken to the compost heap. Initially, the lawns look a bit ‘ruffled’, but after a feed they recover surprisingly quickly. During wet summers, a fungal infection called ‘Red thread’ may occur. 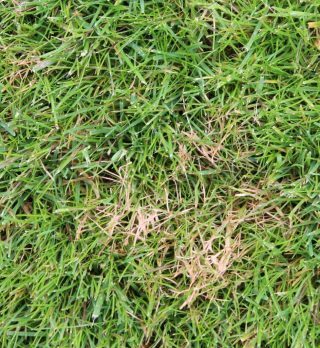 This is a common cause of patches of dead grass on lawns during wet summers and in autumn. It is caused by the fungus Laetisaria fuciformis. It is important to spot Red Thread infections early and treat them with a fungicide. Finally, weeds such as dandelions or clover are treated by spot-spraying with Grazon whenever necessary. 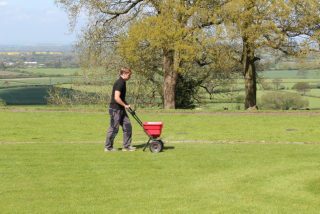 Since the introduction of this very simple and inexpensive treatment regime, our lawns look beautiful throughout the summer.